Tesla's first electric car for the masses is almost here. In a series of tweets Sunday, Tesla CEO Elon Musk said the company's Model 3 vehicle is officially in production and that the first 30 customers will receive their cars by the end of July. Production will continue to ramp up with 100 more customers receiving cars in August and 1,500 in September, Musk said. Musk tweeted Tesla hopes to be producing 20,000 Model 3 cars each month by the end of 2017. Hundreds of thousands of people preordered the Model 3 soon after Tesla unveiled it last year. 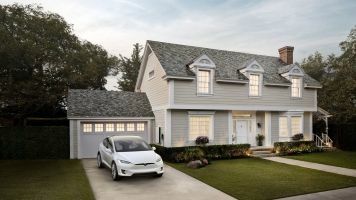 Related Story Tesla's Solar Roof May Be Stylish, But Is It Affordable? The Model 3 is by far the cheapest vehicle the electric car company offers. Before incentives, it costs $35,000 — while Tesla's Model S and Model X are significantly more. Musk expects interest in the Model 3 to help boost Tesla production as a whole. The company's goal is to produce 500,000 vehicles in 2018, which is about six times as many cars as Tesla produced last year.